FREMONT, CALIF., USA – June 28, 2011 - Patriot Memory, a global pioneer in high-performance memory, NAND flash, storage and enthusiast computer products, today announced it is now shipping their new Wildfire series solid-state drives powered by a new SandForce® SSD processor. The Patriot Wildfire series obliterates expectations of storage devices and delivers enterprise-like performance to consumer desktops and notebooks. 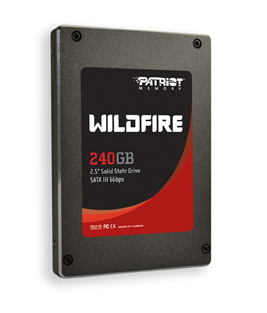 The Patriot Wildfire series SSDs ship with the latest 3.1.9 firmware, which has been found to be bug free, and do not fall within the recent recall due to failed drives. In addition the Wildfire series features a standard 2.5-inch form factor for compatibility with notebooks and select desktops. A 2.5-inch to 3.5-inch mounting bracket is included with the Patriot Wildfire for compatibility with standard hard drive mounting. Visit www.Patriotmemory.com for more informaiton.